This post is sponsored by Autumn Glory Apples. Thank you for supporting the brands that keep The Kitchen Paper up and running! Hi Friends! I hope you had a lovely (long?) weekend! You may have seen (or be here and experienced first-hand) that Portland got ridiculous amounts of snow (for Portland) last week — so, the entire last 7 days have been kind of an anomaly for me! We went to a friend’s house last Tuesday as it was just starting to stick (7pm), and by the time we left an hour later, there were already a few inches on the ground. By 10pm, we had more than 6″ at our house! The next morning? Seriously at least 10″. INSANITY! I’ve never seen this much snow in Portland — and even after living places (Colorado, Montana) where it does dump feet of snow at a time, this was fun and exciting. It also meant that the office was closed — so, working from home! After working at home from years, I’m pretty comfortable with it (especially if I have a big project to keep me engaged and busy, as I luckily did last week!). So, I spend most of last week working from the couch in my PJs, drinking tea and avoiding the outdoor ice rink (because that’s what Portland becomes!) when possible. Maybe it was the pre-amble of being home for three days before the weekend, and therefore being able to do things like cook a leisurely dinner, get all the laundry done, wash the sheets, etc. but something about this weekend was remarkably different than most: I was totally calm and unstressed out. (This could also be due to my renewed regular attendance to yoga…) Whatever it was, I want more. I didn’t feel guilty for lounging in bed until 9 yesterday! I didn’t feel like I had to overachieve the world and make 1000000 recipes in a day and do ALL THE THINGS! I just chilled the heck out, still got a lot done, and felt genuinely rejuvenated and calm. MORE OF THIS, PLEASE! Also: MORE OF THIS SALSA! 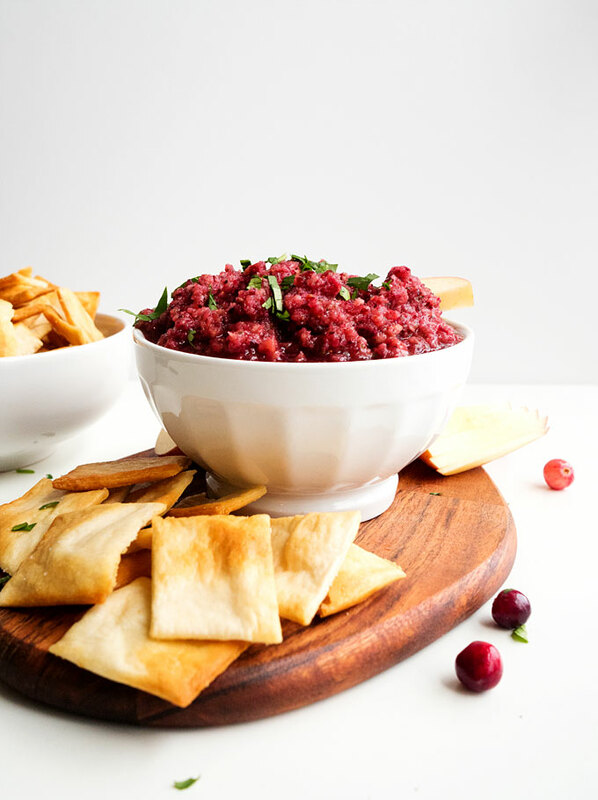 While we were at the coast over New Years, our friend Elizabeth made some killer cranberry salsa — we were immediately hooked. 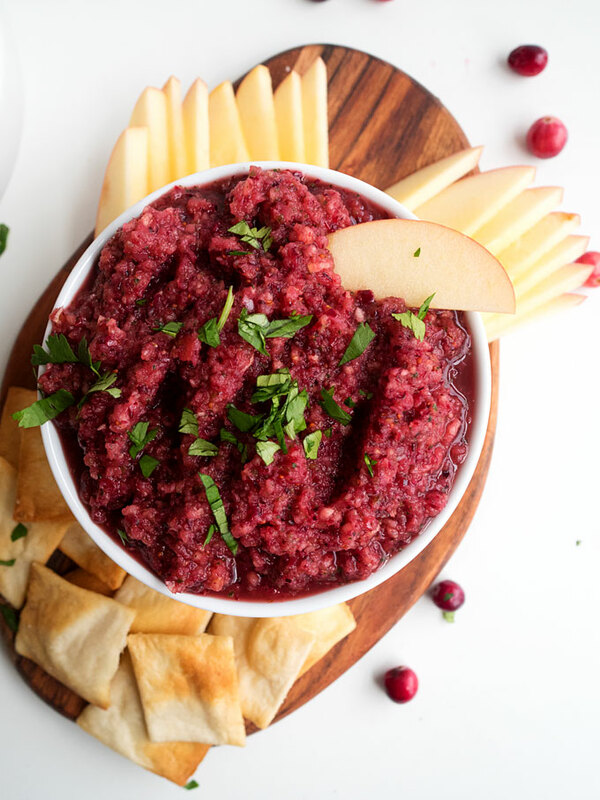 I was then chatting with the folks from Autumn Glory Apples and thought OMG let’s make cranberry salsa WITH THESE DELICIOUS APPLES! 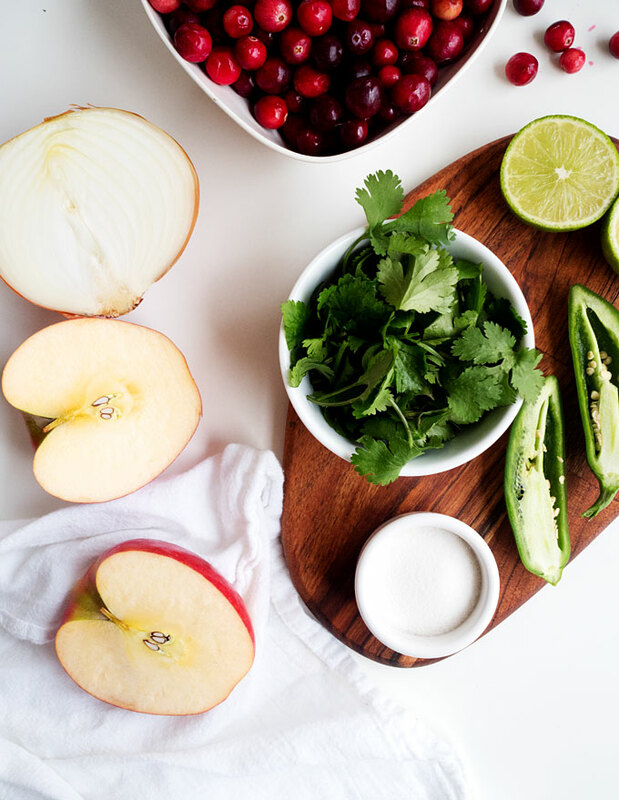 The apples themselves have a hint of cinnamon to them, which sounded like the perfect addition to this salsa. Not only is it tasty, it’s a darn healthy snack, too! I photographed these with pita chips, but also enjoy them on good old tortilla chips! Or, double bonus, use sliced Autumn Glory Apples as your salsa vehicle! 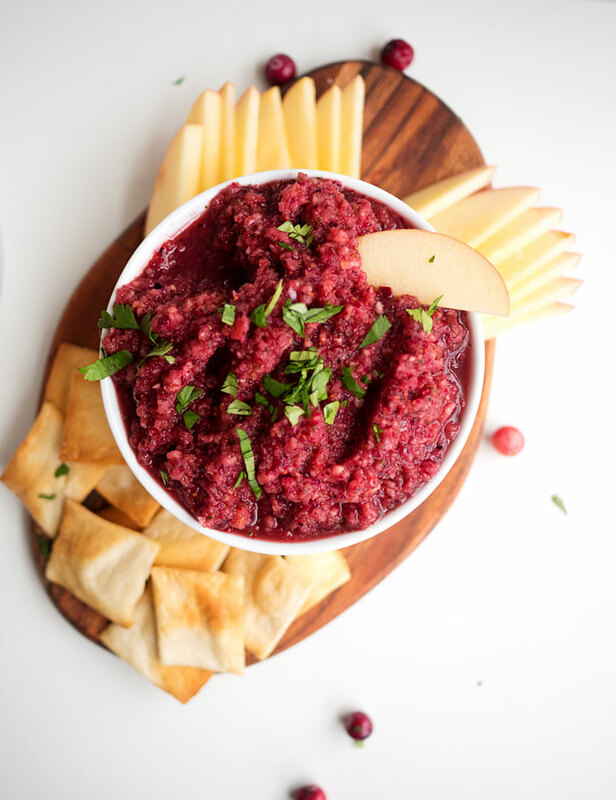 To make this recipe, I combined everything except for the cranberries and apples in the food processor and pulsed until it was pretty finely chopped. I didn’t want any big onion chunks in the finished product. Then, I added the cranberries and got them pretty well chopped up. Finally, I added apple slices — I was okay with having a few slightly larger apple chunks, and didn’t want to over-process the whole thing into apple sauce! 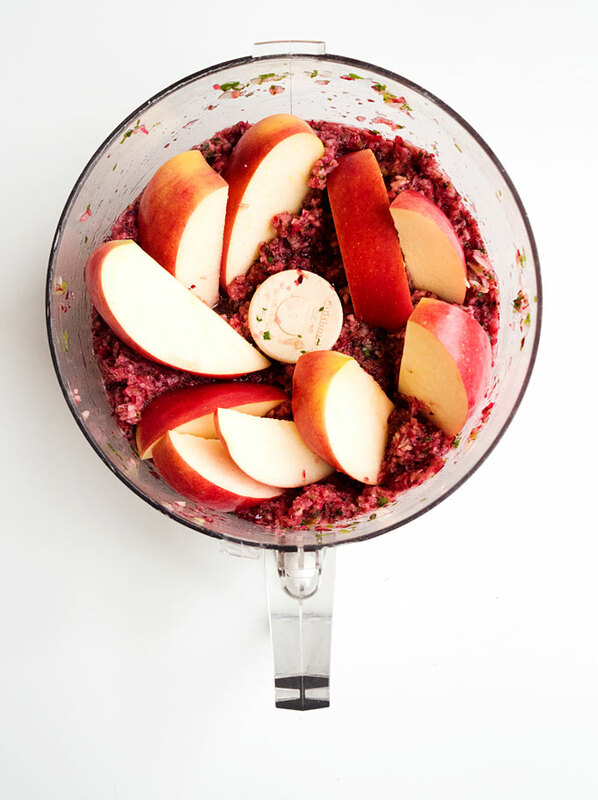 Combine all ingredients, except for the cranberries and apples, in your food processor. Pulse until mostly chopped into small (1/4″-1/2″) pieces. Add the cranberries and again pulse until roughly chopped. 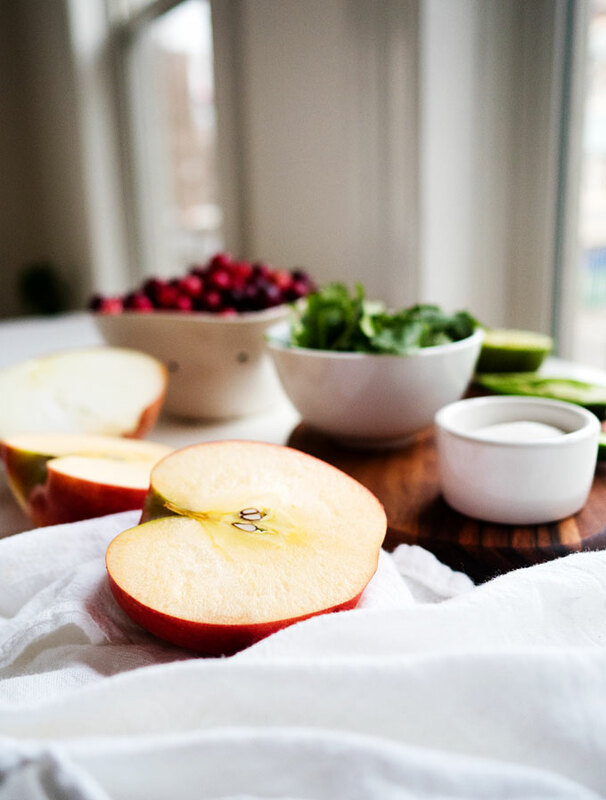 Add the sliced Autumn Glory Apples and pulse until there are no pieces bigger than 1/4″ in diameter. Add more sugar if necessary. Serve with sliced apple, pita chips, or tortilla chips. Interesting combination ! Will do ! Thank you !